Dujail paid in blood for the failed attempt on Saddam Hussein's life three years into his rule in 1982. Hours after bullets aimed at the then leader's convoy missed their target, the military attacked the Shia Muslim village 40km north of Baghdad. Scores of its residents were executed, hundreds more were tortured. The orchards and groves upon which their livelihood depended were destroyed. Dujail's villagers are not the better-known victims of Saddam Hussein's rule, unlike the Kurds of Halabja or the Shia of Basra. But they are set to become the first Iraqis to testify against their former leader in court, as officials plan to launch his trial by focusing on the events in Dujail. The episode has a symbolic value for Iraq's new government - many of those involved in the assassination attempt had ties to the Daawa party, the Shia group to which Prime Minister Ibrahim Jaafari belongs. There is also, apparently, plenty of fresh evidence linking Saddam Hussein directly to the crackdown on Dujail. 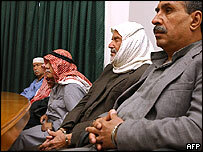 According to a report by the Associated Press news agency in 2003, a presidential decree ordering the execution of scores of men from the village was discovered in Baghdad during the ransacking of government offices that followed the regime's collapse. There appear to be plenty of witnesses willing to testify. One of them, Um Talal, told UK newspaper The Times that her husband, six sons, six daughters, daughter-in-law and grandson were detained after the assassination attempt. The men, she says, were taken to Baghdad's notorious Abu Ghraib prison, never to re-emerge. Her daughter-in-law and grandson died in gruesome circumstances at another prison, she said. Sheikh Faris al-Dujaili claims to have been involved in the assassination attempt. Saddam Hussein, he told The Times, was saved by his bullet-proof vehicle. "If only we had had RPGs [rocket-propelled grenades], we would have saved Iraq from this oppressor," he said. Several of Mr Hussein's allies will join him in the dock to face charges over the deaths in Dujail. They include his half-brother and former spy chief, Barzan al-Tikriti, and the former Vice-President, Taha Yassin Ramadan. US newspaper The New York Times quotes a tribunal official as saying both men will offer testimony that implicates Mr Hussein in atrocities carried out in the village.